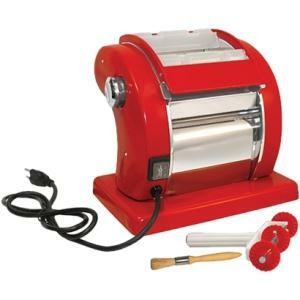 ROMA Express Electric Pasta Machine... Make fresh pasta like a pro at home! Quickly and easily make spaghetti, fettuccini and flat sheet noodles. Nine adjustable settings to make pasta sheets paper thin to 1/10" thick pasta sheets (spaghetti and fettuccini cutters are non-adjustable); Heavy-duty construction and metal housing for a lifetime of use; Fast/Slow roller speed control; 5-3/4" wide rollers; Includes adjustable wheel pasta cutter and cleaning brush; Built-in safety switch that immediately cuts power to the motor when the safety cover is opened.